The point from which to start the loop is a little open to discussion. I've picked the spot I'm suggesting at the parking link on the left of this page because it is the most convenient roadside parking I could find along Foothill Boulevard that's the closest to the main loop. (The fact that the road seems to be wider by an extra lane here makes this block particularly safe for packing/unpacking near your car.) The reason I find this desirable is the quarry trucks that frequently drive back and forth along the Foothill Boulevard segment of this ride route and onto Stevens Canyon Road all the way to its intersection with Montebello Road. Riding along with these trucks especially along the curvy parts of the road is not much fun, and parking at this spot allows me to get this segment out of the way earlier on if I ride here in the morning, when I hope there are fewer of them around (though I don't know for a fact if there really are more of them later in the day). If you don't care about the quarry trucks, then there are alternate parking areas available near the Stevens Creek Dam and on the side of the road adjacent to a picnic area by the reservoir lake just past the intersection with Montebello Road. The former of these is entered through a gate that stays locked until the opening time of Stevens Creek County Park at 8:00 AM (as of this writing), so you may be forced to park outside the lot along the road (for which there is some space available) if you arrive there before that time, while the latter has no such limitation. The ride starts by heading south along the suburban setting of Foothill Boulevard. Very shortly, this avenue turns into a curvy canyon road as it morphs into Stevens Canyon Road. This initial portion of the ride until you come to the intersection with Montebello Road has some of the heaviest traffic you'll find along this ride, especially due to the quarry trucks I've already mentioned, but even that isn't really too much traffic. Stevens Canyon Road initially has a paved shoulder of reasonable width, but this melts away as you approach its intersection with Mt. Eden Road. The part of this ride on Stevens Canyon Road happens to be the portion with the lushest greenery. You'll also catch plenty of glimpses of the picturesque creek bed that parallels the road. The ride's only sustained climb starts as soon as you turn onto Mt. Eden Road. It's not exactly a whopper of a climb at only 0.7 miles of total distance and a grade that rarely exceeds 7%. (It might be hitting 9% in one or two spots, but that's it.) It'll make itself felt, but won't feel challenging to anyone other than inexperienced riders. In terms of scenery, the uphill portion of Mount Eden Road appears like "a climbing version of Stevens Canyon Road". As you crest the climb, though, you'll start passing by some trophy homes and a winery or two. As you go on, things start looking more and more like a typical suburban street network. This portion of the ride has you making a number of arbitrary-looking turns. The main aim here is to complete the loop by sticking close to the foot of the hills east of Stevens Creek Reservoir while avoiding the busier roads (such as Saratoga Sunnyvale Road). Unless you're following the route on a GPS receiver on your handlebars to which you've uploaded the ride's track or you're being guided by someone who's already familiar with this route, your only hope of not losing your way through this part of the ride might be to carry a printed map with you that shows the names of each street you should take, and to consult it frequently. Quick word of warning: I've never completed this ride without missing a turn or two (though I haven't done the ride too many times). Then again, some amount of willing confusion here might allow you to discover interesting alternate streets, but be aware that there is no shortage of cul-de-sacs in this area. If memory serves, on one particular weekday morning when I did this same ride, I had encountered some amount of stop-and-go traffic along some streets within the last few miles of this route, apparently made up of parents driving to or from schools to drop off their kids. I'm not sure if that's always to be expected (especially since the last time I did the ride was also on a weekday morning during school season and there was no such spectacle), but it's just one possibility to keep in the back of your mind as you do this ride. One interesting note that came to my attention during my last ride here is that there is quite a bit of fall foliage to be seen along the second half of this ride, if you happen to do it in the right season. If my experience is any indication, late November may be the time to shoot for, in order to see this. None of the trees that present this display are native; we're talking about plantings in private gardens and the trees that line the streets here. However, that doesn't detract from their beauty. Take a look at the photos at the link on your left to get an idea. There are a couple of obvious ways of extending this route into a longer road ride. One of these would be to add an out-and-back ride segment northward along Foothill Expressway (which is a direct continuation of Foothill Boulevard, where this ride starts). This road is very popular with road bikers and it's as biker-friendly as any multi-lane road could get. There are spacious, paved bike lanes along the side of the road in both directions for the entire length of Foothill Expressway. You can take this road as far as Stanford, if you like, which would almost triple the total distance of this ride. The other easy way of extending the ride would be to take Stevens Canyon Road further without turning onto Mt. Eden Road. You can either do this as an out-and-back spur by taking the road until the spot where it dead-ends at a gate, or you could make it into a wider loop by taking Redwood Gulch Road (though this is a seriously steep climb) to Route 9 and then completing the loop either via Pierce Road or by taking Saratoga Sunnyvale Road from downtown Saratoga to Prospect Road. If you happen to be doing this ride on a mountain bike, a few additional extension options are available to you. 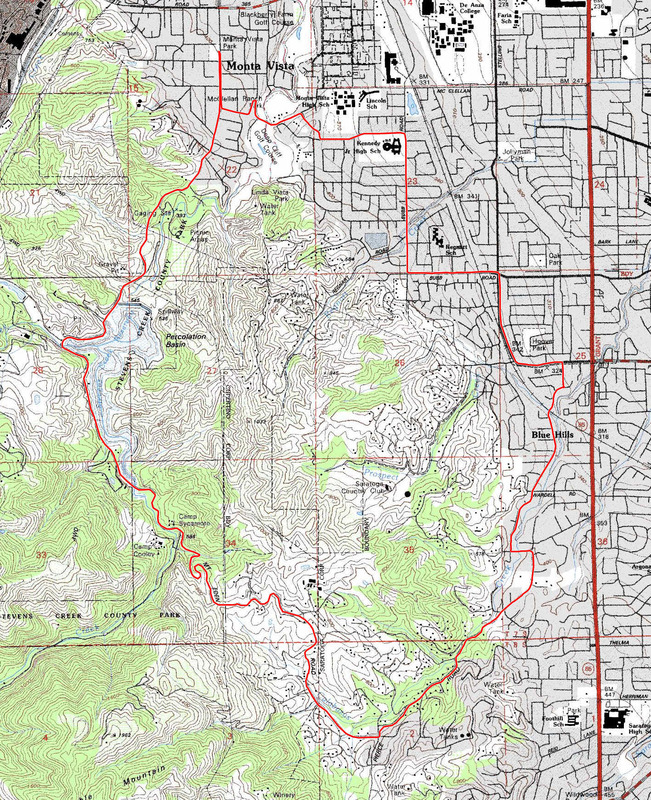 Fremont Older Open Space Preserve happens to fall right within the area encircled by this loop. So, you could simply follow Prospect Road from the second half of this loop into Fremont Older and have yourself some trail riding fun, before returning to roads to complete your ride. It's also possible to "cut into" Fremont Older from near the Stevens Creek Dam by taking Coyote Ridge Trail through Stevens Creek County Park. I should tell you, though, that taking Coyote Ridge Trail in this way will have you climbing 700 feet in 1.5 miles before you make it to Fremont Older. Or you could just stay on Stevens Canyon Road even after it transforms into Canyon Trail and continue climbing on it as far as Page Mill Road, if you like. Another way of incorporating Canyon Trail into this ride would be to turn onto Montebello Road from Stevens Canyon Road, and to climb it all the way to its dead-end where it turns into a trail before reaching the peak of Black Mountain. (I need to warn you, though, that Montebello Road is a killer climb in its own right.) From there, you can take Bella Vista Trail (a singletrack) down to Canyon Trail, and follow Canyon Trail downhill until it transforms back into the paved Stevens Canyon Road.